At the annual meeting of the Industrial Home for Girls Association held at the home, 2940 Highland avenue, it was stated that the year 1909 was the most successful in the seventeen years of the home's existence. During the year it has cared for 1,925 girls, one boy and one old woman. The Industrial Home, which was formerly the Door of Hope, organized originally to care for wayward girls. A year ago it bought the premises it now occupies for $7,000, of which all but $300 is paid. the report for the year shows receipts of $4581.20 and expenses $4,347.97. President, Mrs. E. L. Chambliss; vice president, Mrs. John B. Stone; recording secretary, Mrs. George r. Chambers; corresponding secretary, Mrs. George E. Ragan; treasurer, Mrs. J. M. Moore; board of managers, Mrs. J. W. Stoneburner, Mrs. George A. Wood, Mrs. William Waltham, J. M. Givvons, E. R. Curry, Miss E. Ellis, Miss Ella Albright, Miss W. H. Buls, Mrs. W. Matthews, Mrs. J. Fulton and Miss Foster. Trustees -- R. D. Middlebrook, Judge J. H. Hawthorne, J. N. Moore. Advisory board -- I. E. Burnheimer, H. R. Farnam, Porter B. Godard, Rev. W. F. Sheridan, Judge E. E. Porterfield. House surgeon -- Dr. H. O. Leonard. Matron -- Mrs. S. E. Dorsey. The retiring president, Mrs. George A. Wood, expressed her thanks to all who helped to give the girl inmates a merry Christmas. A free public dance hall for the poor girls of Kansas City, to be built and maintained by the city or by some charitable institution, thinks Dr. I. E. Mathias, chief probation officer of the juvenile court, would be an agency of reform that would do an inestimable amount of good. "Perhaps I am not orthodox, and maybe this scheme looks somewhat sensational, yet I think that it would do an immense amount of good," said Dr. Mathias yesterday. "Girls will dance, and so will boys. How much better it would be that they should have their good times in a free public hall, where they would be protected from rowdies and immoral young men, than in the public dance halls where there are temptations and immoral surroundings, that work to their downfall." The probation officer was discussing conditions in Cincinnati, where he and Judge E. E. Porterfield of the juvenile court went last month to attend a national meeting of juvenile court officers. "This meeting was held in a church that maintained a free dance hall," Dr. Mathias continued. "Everybody is allowed to attend the weekly dances at the church, as long as they conduct themselves properly. There are no toughs and thugs, and the dance is as orderly as any social affair conducted by society people. "In the ordinary public dance halls of Cincinnati liquor is sold, and the dances usually end in fights or drunken brawls. It was to give the poor girls and young men a chance to attend respectable dances that this church put in a dance hall. "Many churches have built expensive gymnasiums for the boys. Charitable institutions here as well as in other cities have made ample provisions for the reform of bad boys. But these good people forget about the girls. Perhaps there is a sewing room set aside for them, or a kitchen where they are taught to cook. These things are all right. But how about their good times? The boys have their gymnasiums, their summer camps and their night schools. "Did it ever occur to you that a girl enjoys a good time the same as a boy? She does not care for gymnasiums, summer camps or the like. The young woman's chief amusement is dancing, but the young men can do things and go places where girls cannot. "What is left for the poor working girl? She can go to these public places where there is every influence to drag her down, but if she has any pride or self-respect she will prefer to remain at home and do nothing. Of course we do not have the evil surroundings in the public dance halls of Kansas City that the young woman finds in those of the large eastern cities, but here they are not what they should be. "The city probably could not build a dance hall. The erection of such a building and its maintenance would be more in the province of the charitable institutions or churches. I think one or more of them in Kansas City would do much to better the conditions of the poor working girl, even more than some of the other philanthropic ideas that have been advanced in the uplift of the poor young men and women of this city." The approach of winter is bringing to the city the usual influx of penniless and homeless, and the charitable institutions are beginning to realize it. Yesterday George W. Fuller, a former member of the park board and representing the municipal labor committee in an official capacity, told the park board that Saturday and Sunday night 150 men out of work and money applied to the institute for food and lodgings. Mr. Fuller suggested that the plan of last year, whereby the city and park board co-operated, be followed this year, of working the unemployed in mining rock and crushing it for road building in Penn Valley park. Single men could be fed and lodged at the institute, and men with families could be given supplies on the basis of a dollar's worth a day. Last year the experiment cost the city $4,918, and about 90 per cent of the rock is piled up and has not been used. W. H. Dunn, superintendent of parks, said that the idea was a good and commendable one, but the question that confronted the city was what is to be done with the unused rock quarried last year. He said that some of it could be used, but advised that if the city was going into the quarrying business again some disposition should be made of the rock on hand. Gus Pearson, city comptroller, urged the board to take up the proposition another year. "It segregates the man who will work from the fellow who will not," said Mr. Pearson. "And it means that whatever the city gives the Helping Hand to care for the poor and lowly, it will get back in labor and rock," argued Mr. Fuller. On motion of D. J. Haff the board set apart $2,000 from the West park district fund with which to pay for the rock that is to be quarried and broken at the rate of 80 cents a cubic yard. Mother Cornelia, assistant to Mother Elizabeth, superioress of the House of Good Shepherd, died yesterday at the home, Twentieth street and Cleveland avenue. Mother Cornelia had been ill for months, but continued with her work at the House of Good Shepherd until last Thursday. Mother Cornelia was Cornelia Thompkins of St. Louis. The family is one of the most wealthy and widely known in St. Louis. A sister, Mrs. Philip Scanlon, died several weeks ago in St. Louis. The body of Mother Cornelia will be taken in a special car to St. Louis this morning by her parents, who are in Kansas City. In taking up her work among the inmates of the House of Good Shepherd, whose lives the sisters try to correct, Mother Cornelia gave up her family and prospects for a life of personal help and self-abnegation. CINCINNATI, O., Nov. 13. -- As a result of the visit of Kansas City men interested in juvenile reform, Cincinnati soon wi ll have a juvenile improvement association patterned after that of Kansas City. Delegates from other cities to the convention of juvenile court attaches also were interested in the pardons and paroles board of Kansas City. E. E. Porterfield, judge of the Kansas City juvenile court and president of its juvenile association, created a favorable impression by his description of the plan by which boys are kept in school through charitable persons paying them a salary equal to what they could make if employed. The speech of Jacob Billikopf of the Kansas City pardon and parole board, in which he gave concrete examples of the work being done for families of persons conditionally paroled from the city workhouse, caused much discussion among the delegates. Dr. E. L. Mathias, juvenile officer in Judge Porterfield's court, took part in the discussion and told of the work done by him. The three Kansas City delegates have left Cincinnati for their homes. NEW QUARTERS AT FOURTH AND WYANDOTTE STREETS. With the acquisition of the old Adkins hotel at the southeast corner of Fourth and Wyandotte streets, the Helping Hand Institute has solved the problem of taking care of the city's unemployed. Carpenters are now at work overhauling the four-story structure and by the beginning of cold weather it is believed that the building will be ready for occupancy. 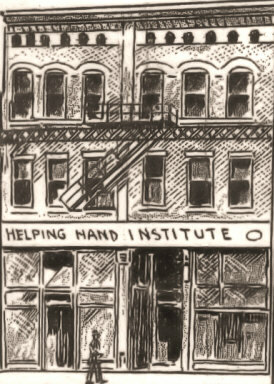 With the old building at 408 Main street, where the main offices are located, the Helping Hand institute will be prepared to take care of more than 600 men without the least crowding. In extremely cold weather little difficulty will be experienced in caring for 1,000 men. PRESENT HOME OF THE INSTITUTE. But the new building will have many features not possessed by the old quarters on Main street. Plenty of light, the best of ventilation, high ceilings, a laundry, shower baths and disinfecting room will make it very little inferior to the municipal lodging house in New York city. On the north side of the building are forty-one windows which makes the light and ventilation problem easy. But the main feature is the shower baths and disinfecting room. On the lower floor the plumbers are at work installing baths that will accommodate twenty-five men at one time. No one will be allowed to go to bed without first taking a bath and allowing his clothes to be placed in the disinfecting room, where they will remain over night. The laundry in the basement will keep the linen clean and eventually save the institution hundreds of dollars. Particular care will be exercised in guarding against tuberculosis. Before the year is over it is hoped that a physician will examine every man who applies for a bed. Without doubt Kansas City will have as good a system for taking care of her unemployed as any municipality in the country. 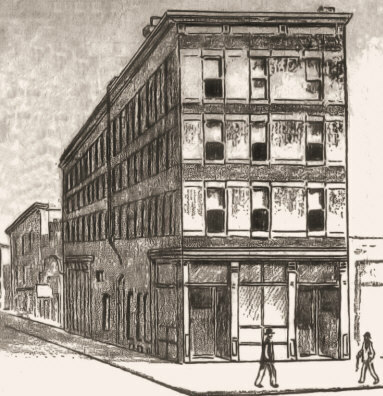 It is true that many of the large cities in the East, particularly New York and Philadelphia, have larger municipal lodging houses but they suffer disadvantages. In most cities bread lines are formed and the man without employment does not feel obliged to work for a night's lodging. In Kansas City, however, the city and county have made the Helping Hand an official charity institution. Men are not allowed to sleep in saloons or in other public places where the conditions are not sanitary. There is no other avenue for the unemployed man but to go to the Helping Hand institute, where he is given a chance to work for his meals and lodging. The mere fact that he must work keeps the professional "moocher" from making his headquarters in Kansas City. The credit for the acquisition of the Adkins building belongs mainly to William Volker, one of the directors of the institute. Mr. Volker clearly recognized the need of more room for the institute, and believing that the employment system is the best, he used his influence in getting the building. E. T. Brigham, superintendent of the Helping Hand, is directing the work. No longer is it the Franklin institute. Satisfied with the great response made to the institute's appeal for aid, S. W. Spangler, agent for Thomas H. Swope, who gave $50,000 in land and cash conditionally to the institute, and John J. Paxton and S. S. Fleming, administrators of the Swope estate, yesterday gave to the directors of the institute the deed to the land on which the Thomas H. Swope Institute is to be built, and Mr. Swope's pledge of $25,000 in money. The deed was filed yesterday afternoon. The officers of the institute received about $55,000 in the canvass for funds. there was $9,101.29 in cash and the rest in pledges. Ralph P. Swofford, president of the institute, Fletcher Cowherd, treasurer; and Benjamin B. Lee, H. D. Faxon, Herbert V. Jones, D. L. James, directors, and James T. Chafin, head resident of the institute, took the certificates of deposit and the pledges to Mr. Spangler's office yesterday. Mr. Paxton and Mr. Fleming, Mr. Swope's nephew, arrived soon after. "We are satisfied entirely with the result of the campaign and with the pledges," Mr. Paxton said. "Speaking for Mr. Fleming and myself, I wish to say that every one of the Swope family sympathized with your effort to raise the fund and with the purpose for which Mr. Swope made the gift." "My uncle was deeply interested in the institute," Mr. Fleming said. "I am glad you were successful and trust that you will be able to make the institute all that you wish it to be." A photograph of Mr. Swope was given the institute officers. It will be framed and placed in the new institute, which is to be named for Mr. Swope. Thousands of dollars were given to the institute fund yesterday after the announcement was made that the fund was complete. The latest mail yesterday brought more and it is believed that the flood of subscriptions which started Friday will not end for several days. Dr. W. S. Woods, of the Commerce Trust Company, gave $500 after the fund was complete. The Kansas City Live Stock Traders' exchange considered a motion to give $100 to the fund. A member suggested that a collection be taken instead. The collection was $225. The Kansas City Live Stock exchange also gave $100. More than that amount was given by the employes of Emery, Bird, Thayer's, when nearly 300 persons working in the store gave 25 or 50 cents each, after the fund had closed. Six church societies, half of them Christian Endeavor bodies, also contributed. "Personal Help," by Churchill Bridgeford, a live stock commission man, netted the institute $1,-34 from the stock yards district in the campaign. The board of trade raised $450 and its members gave, or solicited, $2,500 for the fund. Officers of the institute will visit other cities for ideas before the plans of the new institute will be agreed upon. One of the great needs of Kansas City, the officers say, is a modern creche. The institute now cares for children 2 years old and more, but has not been equipped to care for infants. It has been necessary to refuse to care for the babies of several mothers who are employed because of this. It is probable a creche will be added to the activities of the institute in the new building. Not Enough for Cold Nights. Every bed in the Helping Hand Institute was occupied at 1 o'clock yesterday morning and fifteen men, for whom the officers could find no accommodations, slept in the chairs of the assembly hall. The drop in temperature Saturday night was responsible for the large number of applicants. Indications now are that the plan to add 600 more beds will fall through. At present there are accommodations for 500 men. The officers expected to double the number of beds. The officers had gone as far as to order some new equipment. The building on Fourth street between Walnut and Main, owned by the city, the officers expected to get. The city, however, has refused to donate the use of this building. Consequently the plan of increasing the number of beds has been abandoned.